In 2009 a group of passionate UMass students proposed a simple, but revolutionary idea to the Director of UMass Auxiliary Enterprises, Ken Toong. Their proposal was to install edible and ecological permaculture landscapes right on campus. Permaculture landscapes, as the students explained, are perfect for a campus setting because they are replicable, scalable, and highly adaptable. 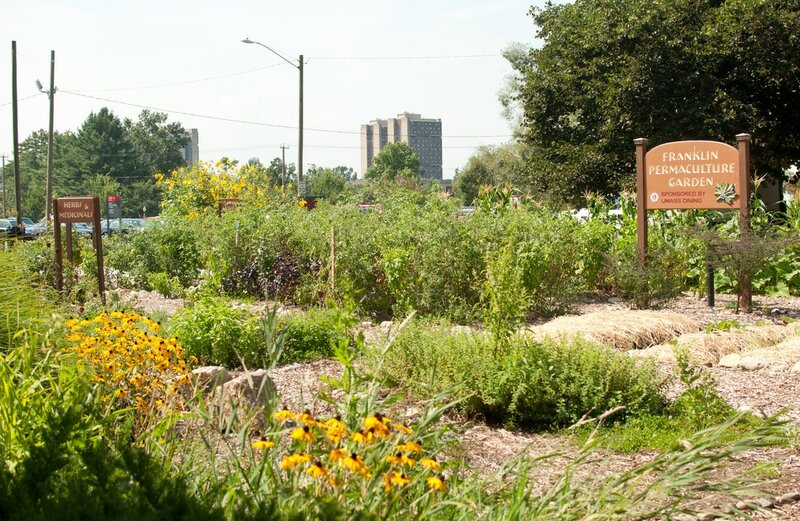 They provide nutritious food to the dining commons, improve the quality of the land, create hands-on learning opportunities, and give students and volunteers a connection to their food and the food system. ​Toong fully embraced the idea, and in 2010 hired Ryan Harb, a recent Green Building Master's student who transformed his front yard into a permaculture garden, to oversee this ground-breaking project. 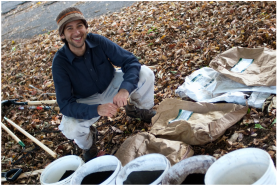 In fall 2010, Ryan gathered a group of student leaders to turn the garden idea into a reality, creating the first-ever UMass Permaculture Committee. In the winter of 2011, the committee hosted a design charrette, bringing together over 100 campus community members to learn about the program and provide input. 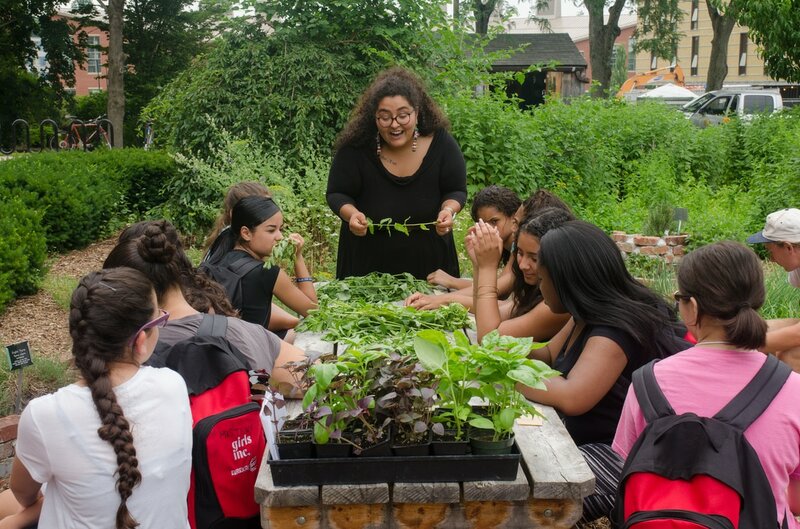 Involving the community was a key goal, allowing the garden to address stakeholder’s needs and wants, and giving community members shared ownership of the space. 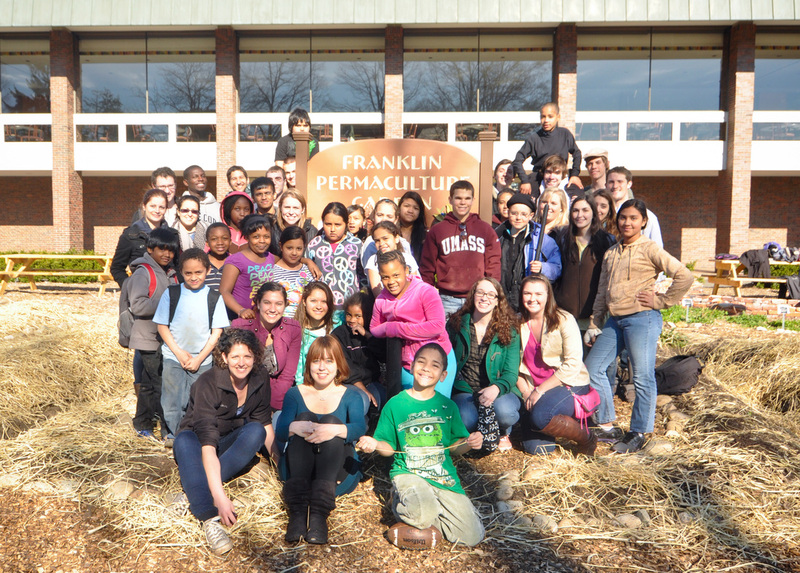 In one year, over 1,000 students, faculty, staff, and community volunteers came together to transform the 12,000 ft2 grass lawn in front of Franklin Dining Commons into a beautiful, edible, educational garden. and building of a campus-wide movement! 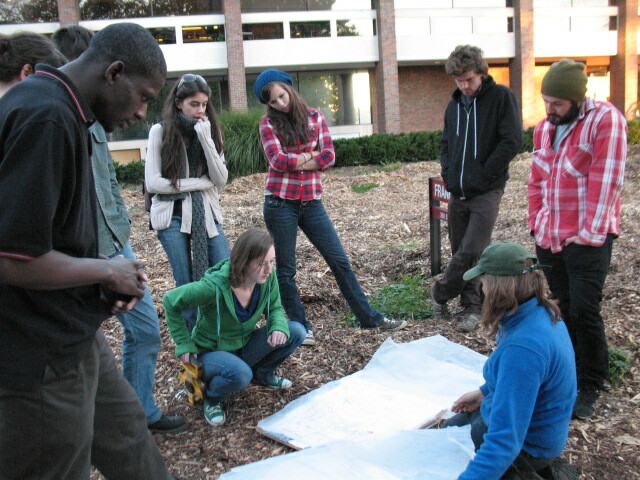 ​Within 2 years, the UMass Permaculture Initiative won numerous accolades, including 7 national awards. 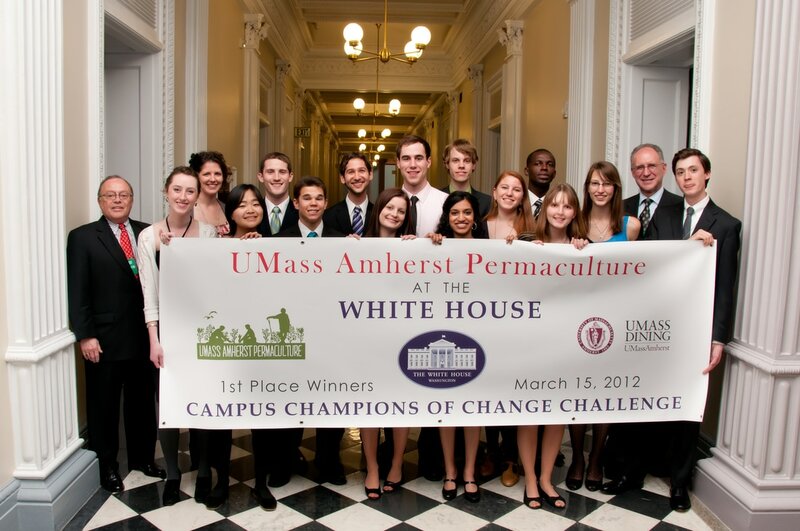 In 2012 UMass Permaculture received first place in the White House Campus Champions of Change Challenge after being selected from a pool of 15,000 applicants by White House judges and the public. To accept this award, the committee was invited to Washington DC for a special event with President Barack Obama in March of that year. Trailblazers of campus education, the student-led UMass Permaculture Committee brought educational workshops, experiential learning, and participatory, community building projects to the student body. The students on the committee received academic credit for their work on campus thanks to a partnership with the Stockbridge School of Agriculture. Stockbridge faculty and staff have acted as mentors for the UMass Permaculture Initiative since its beginnings, and have served a key role in developing academic programs in permaculture. ​To date, the UMass Permaculture gardens have produced over 6,500 pounds of fresh, local, organic produce for the UMass dining commons. The initiative has involved 5,000 volunteers, ranging from local children's groups, to international permaculture students, to collegiate dining administrators from across the country. Since 2010, UMass Permaculture has created 5 edible, educational, and biodiverse permaculture gardens on campus, with one at each of four UMass Dining Commons, as well as at the Chancellor's house on campus. At its core, UMass Permaculture aims to provide empowering hands-on education and develop students into leaders who, when they graduate, are prepared to address some of the world’s most pressing issues. It serves as a source of inspiration, and an outlet for involvement, for countless students; changing paradigms around how food is grown, who can grow food, and how land can be used. 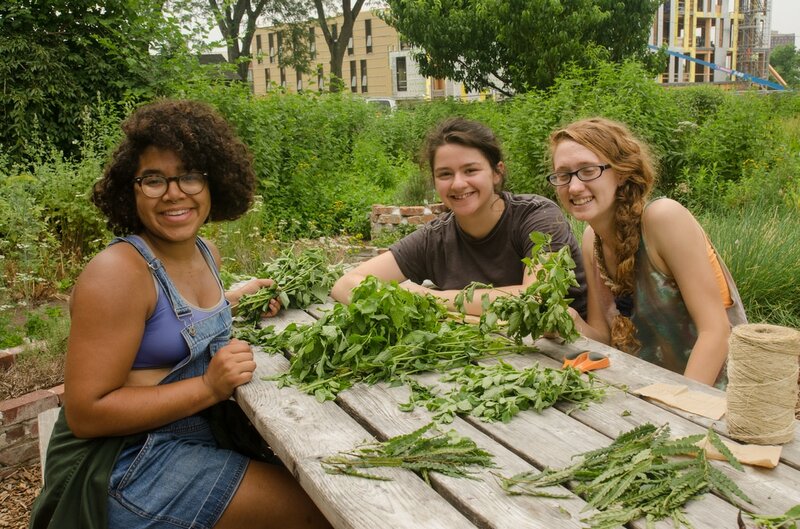 UMass Permaculture strives to serve as a replicable model, spreading the concepts of regeneration and community-based food systems, and inspiring permaculture projects at campuses across the world.